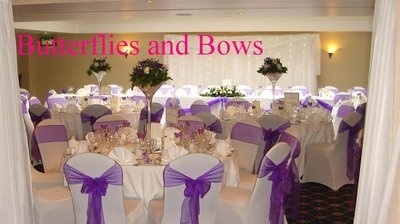 We provide a personal, cost-effective service, for Flowers, Decorations and Balloons for your special day. Beautiful, affordable wedding bouquets, corsages, buttonholes, pedestal arrangements, pew ends, table centres and top table displays Imaginative, elegant tablecentres including flower Vases, candelabra and ostrich feathers, free vase hire location dependent. Wall and ceiling decorations, including ceiling drapes, curtain drapes, bows and swagging. Top table backdrop with drapes of organza and voile, with fairy lights Chair covers and sashes Stunning balloons - table bouquets, arches and special displays such as Cloud Nines and sculpted columns Package Discounts when flowers and / or decorations and balloons are taken. Our speciality lies in providing you one service or a whole package for your special day; with flowers, decorations and balloons for your ceremony and your reception. We can provide an excellent service to you as a single supplier for all your requirements, making it easier for you with just one contact point instead of several different companies. We do not have the overheads of a shop so we can provide a very cost effective, efficient service and will work closely with you to ensure that your every need is catered for and your wedding is special and is exactly as you would wish.